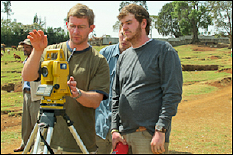 David Lovell (left) works with undergraduate students on an Engineers Without Borders project. Associate Professor David Lovell (CEE/ISR) is one of six A. James Clark School of Engineering faculty members to be honored in the first class of ENGAGED Faculty. Lovell has served as Engineers Without Borders' faculty adviser since 2010. The Clark School bestows this honor through undergraduate student nominations. Faculty were nominated for being approachable and accessible, taking a genuine interest in and having concern for their students (especially outside the classroom), having high expectations of their students, and providing encouragement, advice, and support to students in academic and extracurricular activities. These dedicated and patient faculty are both mentors and positive role models. The ENGAGED Faculty project is a component of the National Science Foundation’s ENGAGE: Engaging Students in Engineering program. The University of Maryland was one of ten schools selected to participate in the first year of the program that implements research-based strategies to enhance the retention of undergraduate engineering students.